A guide to Brawl Stars' Dynamike. We go over the Brawler's strengths, weaknesses, and strategies in each of the game's modes. 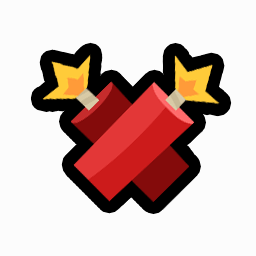 Dynamike is an aggressive hero who lobs bundles of dynamite at enemies. With careful aim, he can deal large amounts of damage to enemies from safely behind cover. 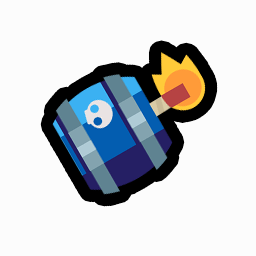 Big Barrel o’ Boom allows him to deal immense amounts of damage and destroy obstacles from the same safe location. a single hit if hitting them point blank. Cover Love – Given his lob, Dynamike can attack enemies from behind obstacles. This can make him very difficult to retaliate against, especially if his target lacks any sort of lobbed ability themself. Delayed Lob – While it can deal heavy amounts of damage, Dynamike’s TNT takes a bit of time to detonate. This can make aiming a bit difficult and offers the enemy a chance to dodge the blast. Players will have to practice quite a bit to master the miner’s might. Short Fuse Mike tosses two sticks of dynamite, passing over any obstacles in the way. The fuses are cut as short as Mike’s explosive temper. Short Fuse not only has a travel time, but explodes a second after landing. This requires Dynamike players to lead their shots considerably in order to hit their targets. Choke points and map objectives are good places to lob some dynamite and catch enemies who are trying to advance. The closer that the target is to the explosion, the more damage they take. Big Barrel o’ Boom A big-bada-barrel of dynamite blows up just about everything. Enemies get knocked back on impact! Similar to Short Fuse, Big Barrel o’ Boom has both a travel time and a waiting period after landing and thereby requires careful aim. Dynamike will need to go on full offense in gem grab, focusing more on killing and zoning out enemies than gem collecting. Find a wall to hide behind and chuck sticks of TNT at the opposition to cause as much chaos as possible. Solo – Dynamike will need to move cautiously to avoid getting ambushed by a short-range Brawler. Use obstacles to your advantage to keep safe from your targets as you bombard them with TNT. Duo – Back up your partner with damage via TNT. Use it to flush enemies from tall grass and punish anyone trying to hide behind obstacles. Big Barrel o’ Boom can be great when wanting to clear a path between your team and a target. Dynamike does well both in attacking the safe or clearing a path for his team. Try to pick up some hits on opponents as your rush to the opposite end of the field and then bombard the safe. If possible, do this from a side and from behind cover. Use Big Barrel O’ Boom to destroy the wall separating the safe from the rest of the field so that your allies have an easier time attacking it. Use Dynamike’s lobs to your advantage. Find a safe spot and barrage the enemies with TNT. Keep a wall or water in between yourself and your targets for maximum safety. Throw TNT before your enemies; even if you miss, you will force them to slow down or retreat, buying time for your team. Brawl Ball is not Dynamike’s strong suit. Hit enemies as they cluster around the ball to damage them all. Big Barrel o’ Boom can open up the path to the goal to give your team an easy path to scoring. Dynamike can be decent at taking out the boss, able to provide large amounts of damage. Cover won’t go too far here, though, and he doesn’t offer many tricks to the team. As the boss he will have to rely completely on his damage output to survive. Carefully placed sticks of TNT will be able to very quickly clear out enemies and earn him time in the process. Again, Dynamike’s contribution to Robo Rumble is damage alone. Be careful with Big Barrel O’ Boom as to not open an easy path for robots to take to the safe.